This past week, documentary filmmaker, Tom Wagner followed me around as I prepared and gave my lecture at SVA. He also took some time to sit down with Cristin, Heather, Maria and I as we discussed the next steps for the Spire project. My next phase will bring me to Grand Rapids. I would like to extend warm thanks to everyone who attended my lecture last night at SVA. 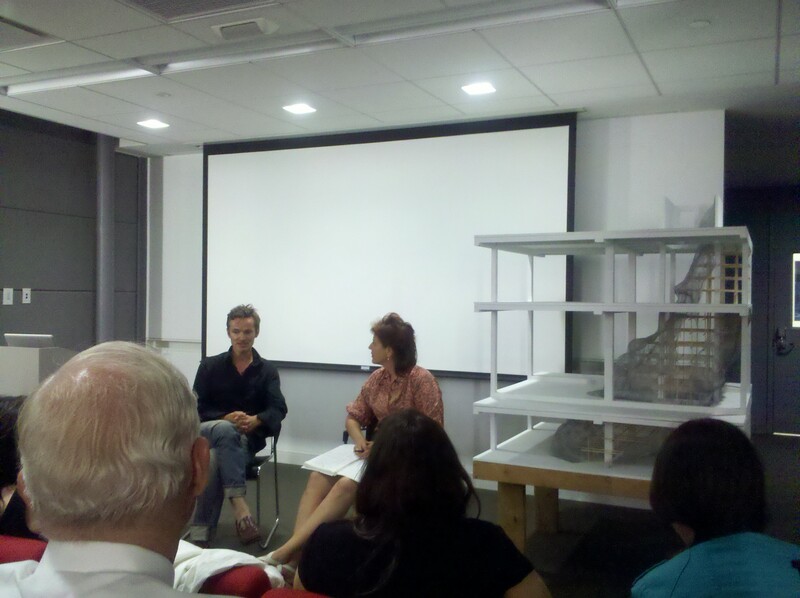 It was great to discuss my project with a large audience filled with artists, architects, designers and scholars. Thank you to Keren Moscovitch, Anita Glesta, and Cristin Tierney as well. As you may know, I am giving a lecture at the School of Visual Arts on Thursday, July 28th, 6:30 – 8:30 pm. I will discuss Spire in the context of art and architecture and how constructing temporary forms can revive and transform an existing space. Here is just one of the images I will show in the lecture. 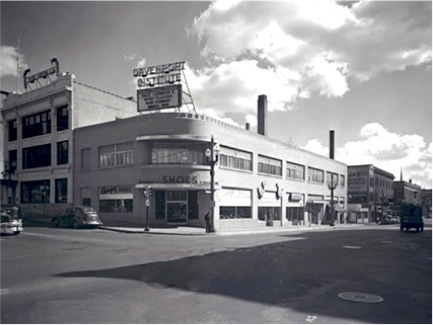 It is an historic photograph of 2 East Fulton Street in Grand Rapids, Michigan. The photo of the scale model of Spire was posted on Pacific Standard as the Image of the Day. Very cool. I am excited to announce that the Kickstarter page for SPIRE has been launched. Please support my ArtPrize project. To learn more, please click here. 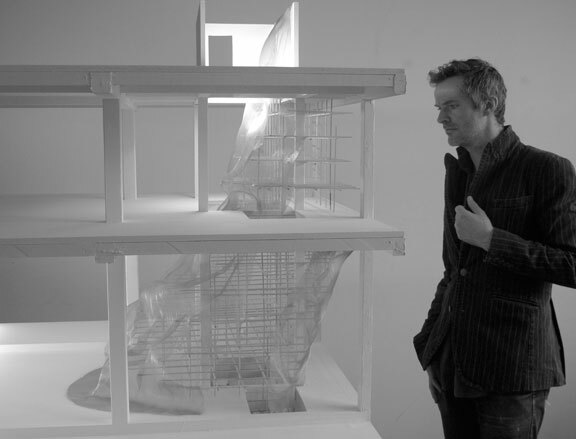 On Thursday, July 28, 2011 from 6:30 pm – 8:30 pm, I will give a lecture at SVA to discuss SPIRE in dialogue with Anita Glesta, the coordinator of Reconfiguring Site: New Approaches to Public Art and Architecture. The event is free and open to the public. View the invitation here. To RSVP, contact Keren Moscovitch at kmoscovitch@sva.edu. I hope to see you there! I am happy to announce that I have been officially connected with my venue hosted by SiTE:LAB and the University of Michigan School of Arts and Design. 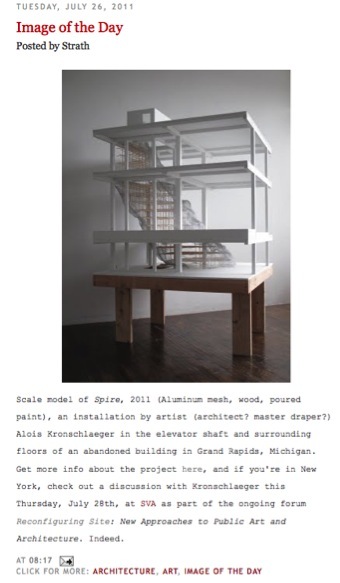 Cristin Tierney is pleased to announce Alois Kronschlaeger’s participation in ArtPrize 2011, a one-of-a-kind arts exhibition held annually in Grand Rapids, Michigan from September 21 through October 9, 2011. His most ambitious project to date, Kronschlaeger’s new site-specific work entitled, Spire, will encompass three floors of an abandoned commercial building in downtown Grand Rapids. This installation is hosted by SiTE:LAB, a local nonprofit that coordinates temporary art projects, and the University of Michigan School of Art & Design. Like most of Kronschlaeger’s work, Spire will demonstrate a preoccupation with environment and light, exploring the ways in which new materials can revive and transform a space. 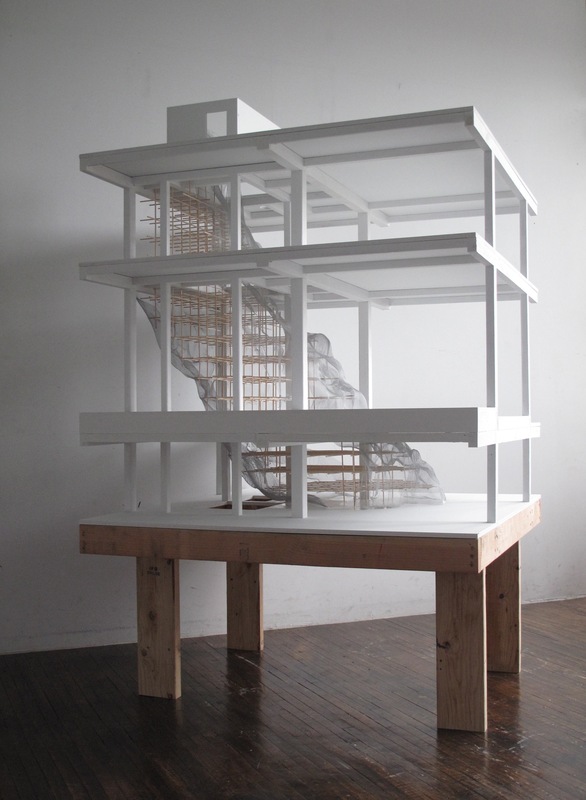 Kronschlaeger will be giving a lecture about this project on July 28th, 2011 at 6:30 pm at the School of Visual Arts with Anita Glesta, coordinator of SVA’s Reconfiguring Site: New Approaches to Public Art and Architecture program. The lecture will take place at 141 West 21st Street, Room 101-C between 6th and 7th Avenues. For more information or to RSVP please contact Keren Moscovitch at kmoscovitch@sva.edu. Prior to opening the gallery at 546 West 29th Street, Cristin Tierney worked as an advisor for a number of private collectors and institutions in the United States. While continuing to work with certain long-standing advisory clients, Tierney has opened an exhibition space to promote the work of a select group of contemporary artists. Upcoming exhibitions will include projects by: Eve Sussman and the Rufus Corporation, Jorge Tacla, Tomas Rivas and Malia Jensen, among others.